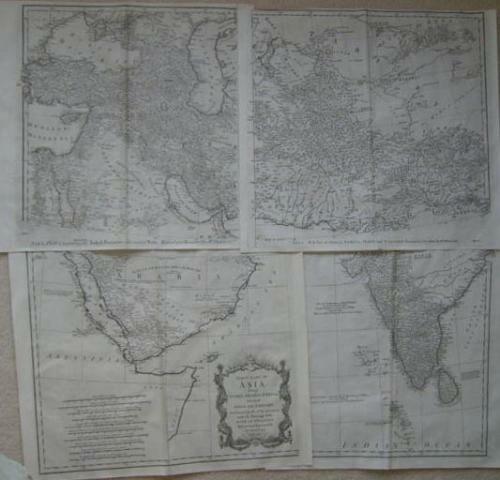 A very large map of Turkey, Arabia, Persia, India and tartary published in four parts in 1755. The title of the map is "First Part Of Asia Being Turkey, Arabia, Persia, Most of India and Tartary. Performed By The Sr. D'Anville, Under The Patronage Of The Duke of Orleans Revised and Improved by Mr. Bolton 1755". The map consists of four seperate maps which join to form one large map of The Middle East with Turkey, Arabia and Persia and India and Tartary. When the four maps are joined together, the large Africa map the results measures 31 inches by 30 inches. The map is very detailed and finely engraved on heavy paper. Very nice cartouche. The map is in very good condition with the original folds as issued.